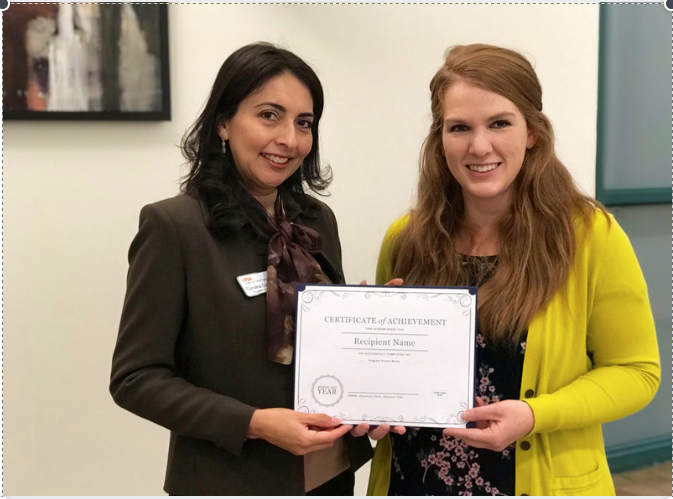 UTSA student receives PVSA certificate of achievement. April 27, 2017)—The UTSA Center for Civic Engagement held a special ceremony to honor eleven UTSA students for their passionate service and their unique community contributions. Six students were recipients of the 2017 President’s Volunteer Service Award (PVSA), a recognition given to individuals who accumulate more than 100 hours of service in any given year. The PVSA Award is an initiative of the Corporation for National and Community Service that celebrates civic-minded individuals for service and volunteerism. Recipients receive a personally signed letter from the President of the United States and a customized gold, silver or bronze pin that signifies a level of achievement. James Pobanz, a social work graduate student, completed more than 281 hours of service in 2016. “I am extremely privileged to be receiving this award, as I reach the end of my academic career at UTSA” he said. “It gives me a sense of accomplishment and motivation to do more and try harder to help those in need.” Other honorees include were Ahmeed Wazeer Hameed, Zachary Miranda, Ryan Dennett, Gordon Russo and Yvette Michelle Estrada. Six additional students were presented with certificates and cash prizes for being the winners of the Roadrunners Engaged Ethical Photo Contest. Students submitted photos of their community work alongside a meaningful reflection through a social media platform and were judged by UTSA faculty, staff and peers. Students photo contest winners pose in front of the photo wall display at the University Center. The winner images have been on display all week long as part of UTSA’s National Volunteer Week celebrations. The UTSA Center for Civic Engagement empowers students, faculty, and staff to serve society through community engaged scholarship that enriches learning, promotes civic literacy and contributes to the study of community needs and resources.